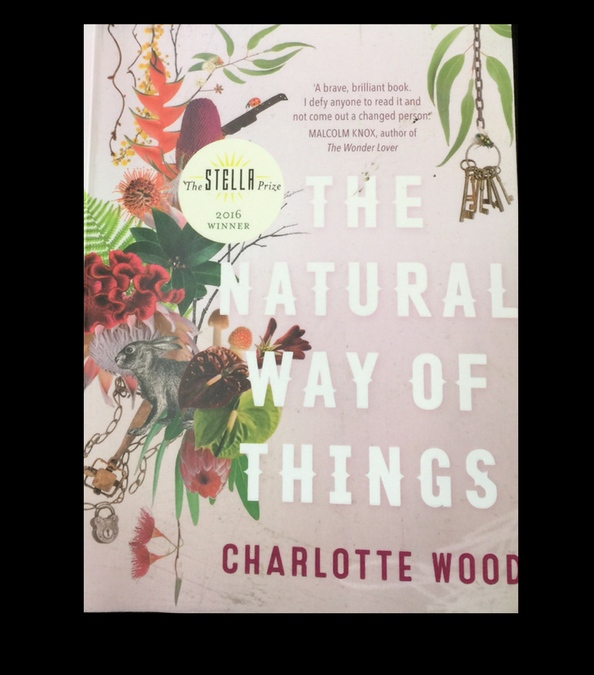 That’s what I would call Charlotte Wood, having just finished reading her Stella Award novel, ‘The Natural Way of Things’. The first thought that fixes in my mind is “unnatural”, and this novel is disturbing, to say the least. I have had friends say they couldn’t finish reading it because they found it so disturbing. But even though I was struck by its raw brutality, I persisted. And I have to say, that in the end, I am glad I did. When all is said and done, who wants to read “vanilla” stories? Right? And what this novel serves up on a platter, drives down to the very depths of instinct and human survival – if you thought ‘Lord of the Flies’ was disturbing, this is ten times as disturbing, for me at least. Wood explores the human psyche in crisis when liberty and basic needs are taken away, and the threat of violence, sexual or otherwise is a constant. She explores the social consequences of a group of girls through their harrowing experience and drives us into that dark realm of basic instincts – analogous of the natural world, of animals and their own instinct for survival; I guess that’s where the name comes from too. I call Charlotte Wood brave because all authors expose themselves to the world and the threat of deep criticism – and believe me, they get it! In fact, one of the requisite skills an author needs to learn is to take criticism on the chin and not be affected by negative reviews. And this book leaves Wood absolutely naked! At a recent function run by the Canberra Writers Festival at the National Library of Australia, where she was in conversation with Katharine Wood from The Guardian, Wood defended her book in light of her friends’ personal reactions to the horror of it all, when the book first came out. She laughed and reported what they had said to her, “My goodness, where has all this horror come from? We are having you over for dinner soon, but who ARE you?”, they jokingly sparred with her. Wood kept repeating, “I am really a very nice person! Really!” And the audience believed her. Wood came across as a delightful, unassuming gentle, sensitive person with a passion for her writing. The audience loved her – and her book. And I think, from some of her comments on the evening, as she described her writing process and how she recently left Twitter to focus on writing because she had found it addictive, it became clear that she too, needs to focus and immerse herself into the worlds she creates without distraction, so she can indeed write from the depths of her soul! The book is partly based on facts and Wood was quite emotional when she recalled the history she had researched on this. The book is loosely based around the Hay Institution for Girls, a brutal prison in rural NSW, where ten teenage girls were drugged and taken from the Parramatta Girls’ Home in the 1960s. Wood explained that one of the reasons many of the girls were in the Parramatta and Hay homes was that they had been sexually assaulted and had told someone about it. It was speaking out about what had happened to them that got many of them sent there. They were deemed to be promiscuous and ‘in moral danger’. Which reminds me of another great book, In Moral Danger by Barbara Biggs. Barbara Biggs is a former journalist and author of a two-part autobiography, In Moral Danger and The Road Home, launched in May 2004 by Peter Hollingworth. When Biggs was just 14, she was a troubled runaway with nowhere to go. Along the way, she encountered Bob Vernon (a 42-year-old criminal lawyer). Vernon paid Barbara’s grandmother to let her work for him as a live-in babysitter. Well, as things turned out, in effect, Barbara had been sold to Vernon, including sexually. The story is harrowing and gripping, dealing with similar themes. So my final verdict on this book – initially repelling, and if you persist, compelling!